Christmas Eve and Day--Much Food and Many Smiles! I admit I overcooked for Christmas Eve dinner at my house, but after a few years of not hosting the holiday, I felt as if I wanted to cram those absences into one night. I made the traditional fish feast of linguine with calamari tomato sauce (not pictured), stuffed lobster tails, fried shrimp, lagostino scampi, salmon stuffed with crab meat, scallops wrapped in bacon. and baccala (dried salted codfish) cooked two ways-fried and in a spicy tomato and olive sauce. Plus, to please the nonfish eaters at my table, I made eggplant parmigiana, rib roast with vegetables and veal marsala. For dessert, we had an assortment of cookies that I made and decorated a few days before. 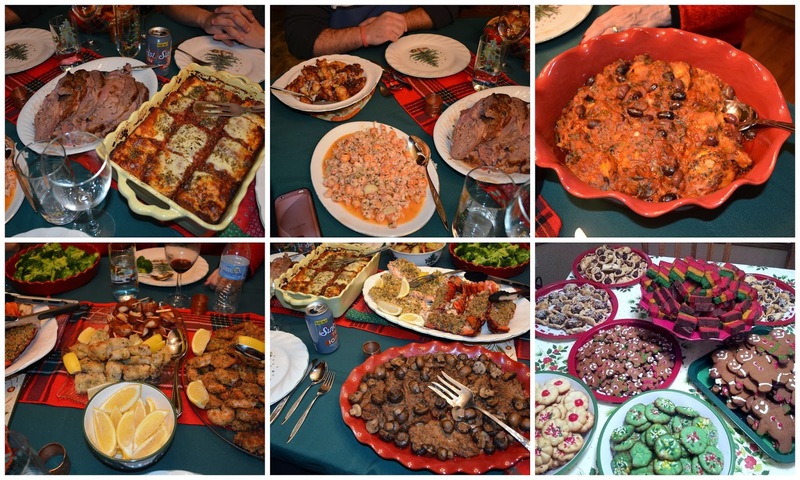 It was a true Italian "abbondanza" feast with enough leftovers to last a few days. The best part of the Christmas Eve evening was watching my granddaughter take her first steps on her first Christmas! 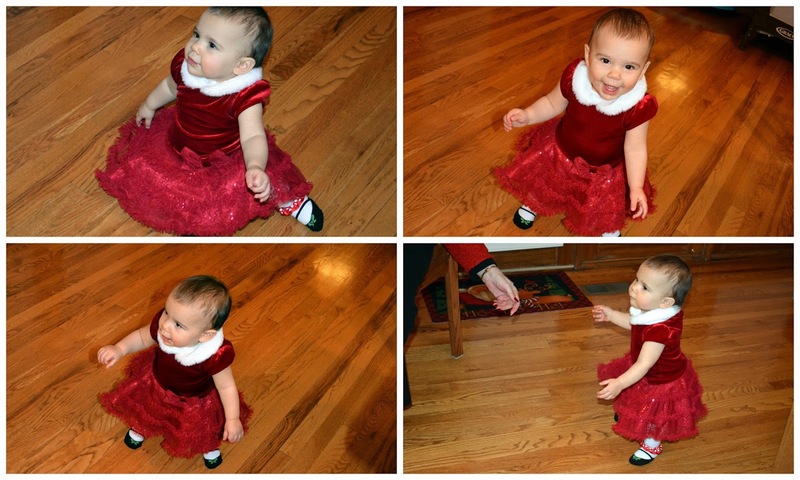 She is close to eleven months old and I believe she will be fully walking by her first birthday. How quickly time flies! Christmas morning we went over to my son and daughter-in-law's house for brunch and watched our grandsons open gifts. 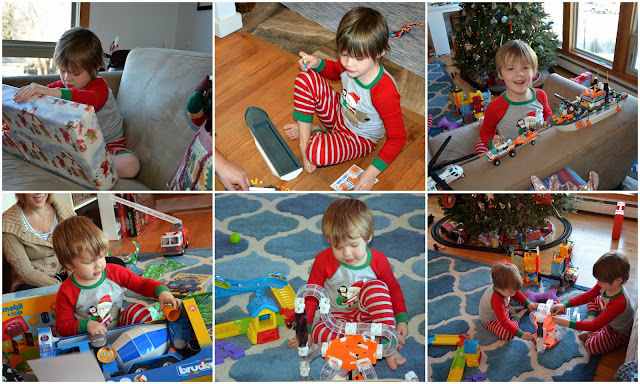 There was lots of gleeful exclamations and many smiles as they played with their new toys. Later that Christmas afternoon we went over to my daughter and son-in-law's house where we watched our granddaughter open her gifts. She liked the wrapping paper and bows almost as much as her presents! 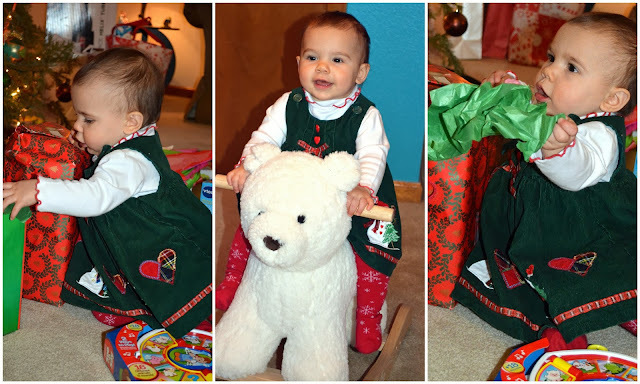 Children really make the holidays "merry and bright," and after spending this Christmas with our grandchildren, my husband and I know we made the right decision to move west last January to live close to them. 2013 has been a wonderful year for us, and it is with joy and anticipation that we look forward to 2014! Thank you to all my blog readers for your friendship and comments throughout the years! Wishing everyone good health, happiness and many blessings in 2014! I opened up bins and pulled out Christmas decorations I haven't seen in a few years to decorate our home this year--our first official Christmas season living in Colorado! The past few years my husband and I traveled west to spend Christmas with our son, daughter-in-law, and grandsons, so I did not decorate in my house in New York. Two years ago, after my daughter and soon to be son-in-law also moved to Colorado, we stayed at their apartment in Denver, near the Governor's Mansion, where we took an open house holiday tour of the same (click here to see that post). Last year, we were busy packing for our own cross country move, which took place a few weeks after Christmas, so all our decorations remained in their bins for another year. ..while others sit on a table in my living room. I even had room for a small Christmas tree in my kitchen this year, complete with a "Big Apple" felt tree topper ornament that a co-worker of my husband made for us! 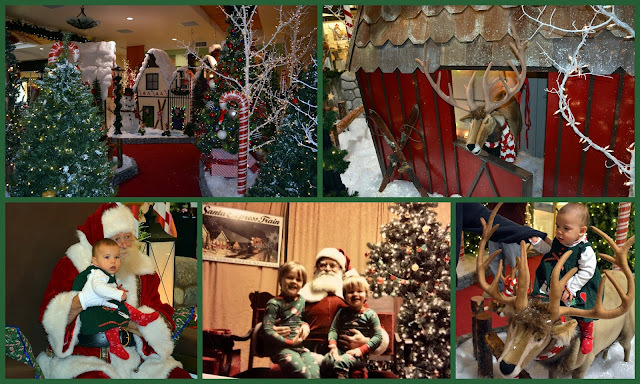 My granddaughter had her first visit with Santa Claus at a very pretty Santa Land in the Park Meadows Mall this month. She did quite well, with no tears shed! Meanwhile, this year my grandsons, wearing their cute Christmas pj's, had an evening ride on the Santa Train at the Colorado Train Museum. We also celebrated my grandson's fifth birthday this month! He likes tales about Knights and Castles, so I made him a castle shaped cake complete with knights defending it. Special effects in the photo are courtesy of Google Picasa who added them on without me doing a thing after I upload them to their web page. 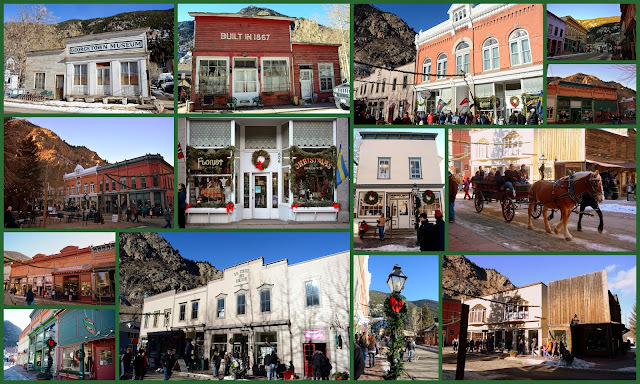 My husband and I also took a day trip up to historic Georgetown, Colorado, last weekend, to enjoy the Christmas festivities in the Rocky Mountains. We enjoyed listening to carolers sing, having some roasted chestnuts and a big freshly baked pretzel to eat, window shopping, and taking a horse-drawn carriage ride around town. I bought my husband a cowboy hat in one of the stores, as I thought he looked great in it! What do you think? Another Google Picasa effect in this photo we took of a creek in Georgetown. Christmas Nativity in front of the Denver City and County Building -- part of the illumination of Denver for Christmas--click here to see that post. Now, in these last few days before Christmas, I am busy baking and planning my traditional Italian "Feast of the Seven Fishes" we have on Christmas Eve, while we look forward to joyfully welcoming the birth of Christ the King on Christmas Day! We have much to be thankful for, and much to celebrate, as the year 2013 comes to a close. The greatest joy of my life is being close to my family again and being able to watch. my grandchildren grow up. That is what life is all about for me! It has been a wonderful first year living in Colorado, and I look forward to what 2014 brings. May good health and happiness be ours, and yours! I wish you all a very Merry and Blessed Christmas! 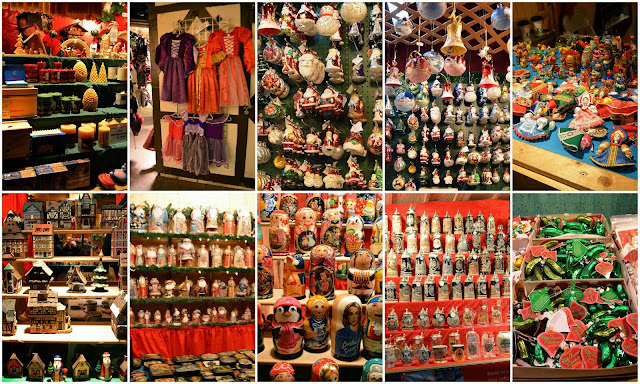 Denver's authentic German-style Christkindl Market is a joyful place to see, shop, and dine. The market is free to attend and is located in Skyline Park in downtown Denver, right across the street from the Daniels and Fisher Clocktower on the 16 Street Mall that I showed in a previous post about the Christmas Illumination of the city of Denver. (click here to see that post). It is open Sunday through Thursday from 11am until 7pm and Friday and Saturdays from 11am until 9pm. This year it will remain open until December 22, an extra day due to the inclement weather earlier in the month. It was lovely to stroll from booth to booth and see the merchandise that was for sale. At one point during the evening, a group of students from a local school sang Christmas carols, which added to the shopping experience. ...and the glassblowers' display of mouth-blown glass ornaments. This collage shows just some of the variety of unique items for sale. There were also food vendors, such as this one selling German and European cookies, candies and other treats such as Christstollen, Lebkuchen, and strudel. This booth had German and other European deli items for sale. 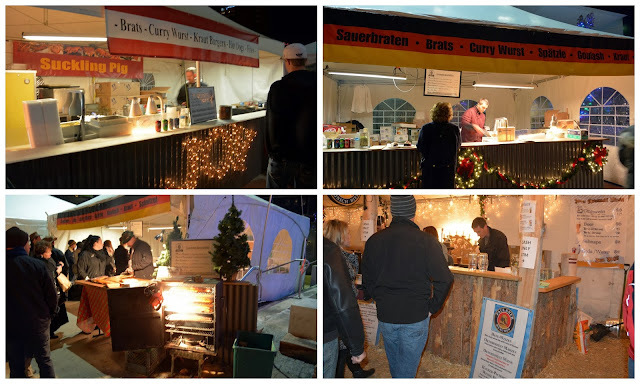 There was also authentic German cuisine for sale, such as Sauerbraten, Brats, Spazele, Goulash, Schnitzel, etc., that you could buy and then sit inside at long tables in a heated tent. Inside the tent, you could purchase authentic German beers on tap to go with your meal, or spiced warm wine called"Gluhwein," (click here for a recipe!) plus non-alcoholic drinks. The tent was large and brightly lit, with plenty of seating. 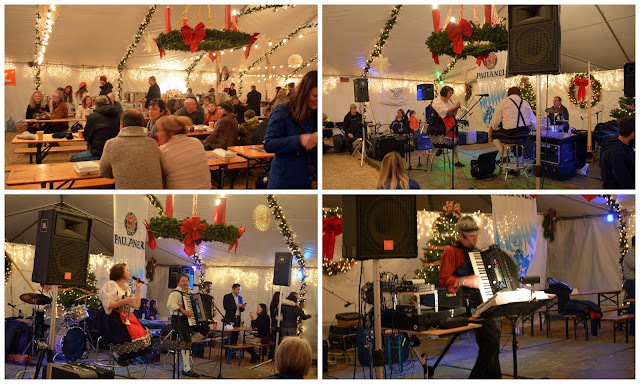 The main stage in the tent had authentic German music and entertainment. Click here for the 2013 entertainment schedule. This is what I purchased at the market this year. The German glass and wooden ornaments on the left were gifts, while the clear glass blown ornament and icicles I purchased for my Christmas tree. Do you know the legend of the pickle ornament? It is supposed to be placed on the tree on Christmas Eve, and the child that finds it first on Christmas morning is supposed to get an extra little gift. Doing some research I found that this really isn't an old German custom, but rather a new one invented recently, but even so I thought my grandsons would like to search their tree for the pickle. My husband and I really enjoyed shopping at Denver's 13th annual Christkindl Market, and hope to make attending it a yearly tradition! Considering a Career Change or Advancement in Nursing? 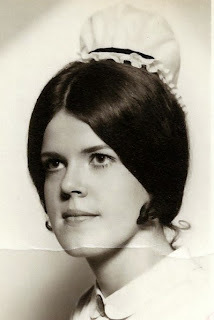 It is hard for me to believe that next year will mark forty years since I graduated from nursing school and became a licensed Registered Nurse! Becoming a nurse was a dream come true for me, as I always wanted to be one since childhood when I first read the children's book, "Nancy Nurse." I wanted to help people who were hurt or ill, and as I grew I knew I had the intelligence, compassion, and fortitude to do it. As a very young teenager, I became a Red Cross volunteer "Candy Striper," and worked in a Veterans Administration Hospital. I basically acted as a messenger and delivered mail from floor to floor, but I was thrilled to be in a hospital and seeing first hand what nurses do. 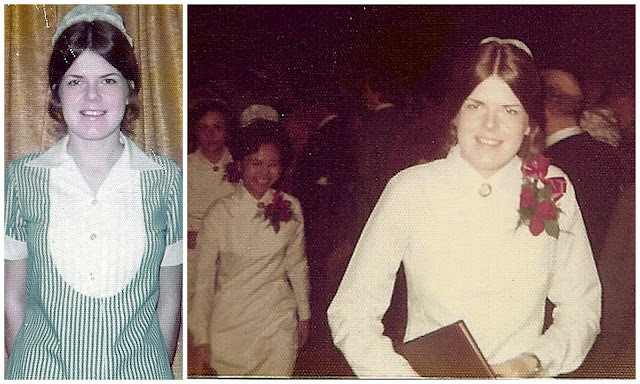 In high school, through my school's "Future Nurses" club, I was able to get a job on weekends in a Manhattan hospital as a nurse's aide. Then I was actually doing real patient care, such as assisting with bed baths and meals and transporting patients for tests in other parts of the hospital. I learned how hard nurses worked, but I loved every minute of it, and it strengthened my resolve that nursing was the career for me! In the early 1970s women and men who wanted to become nurses usually applied for admission to nursing schools, and I was no exception. In three years I went from a student nurse to a fully qualified R.N. and began to work in Surgical Intensive Care in the same city hospital I trained in. Fortunately, the administration of the nursing school I attended had the foresight to realize that the vocation of nursing was soon going to evolve into a more professional status, and that would soon require a college degree. They instituted a pilot program where we would take classes at a local four-year degree college in conjunction with our hospital nursing classes. The college classes lead to about one year's worth of college credits, and I continued taking classes and earning credits towards a degree on my own, part-time, after graduation. Nurses who did the same went from having a diploma in nursing, to a bachelor's degree in nursing, and that increased their career opportunities and enabled them to obtain new opportunities and enter more specialized nursing. Today, I would strongly advise any man or woman who wants to enter the career of nursing to earn their Bachelor of Science Nursing degree (BSN), in an accredited program at a four- year college. Nursing in this generation requires a more comprehensive education that only a college degree can provide. Modern nursing is constantly advancing through new technology, treatments, and research. A Bachelor of Science in Nursing becomes a pathway towards earning higher degrees or certificates that will open the door towards many career opportunities and greater autonomy. Throughout my nursing career, I had to take continuing education and certificate classes in order to qualify for different assignments. As my family grew, and I wanted to spend more time with my children, I worked part-time through nursing agencies as a special education school nurse and later as a home care coordinator. I often thought that if I were at a different point of my life I would have continued my education to earn a Master of Science Nursing Nursing degree (MSN), and perhaps have become a Nurse Practitioner. I'm sure you've had an occasion to use the services of a nurse practitioner in your life, as more and more they are employed by hospitals, clinics, pharmacies, and private doctors' offices. Very often you will be seen by a Nurse Practitioner before, or instead, of seeing a doctor for many basic illnesses. Advanced degree nursing enables women and men to rise in their chosen career, yet often they are over 30, are working full-time and have family obligations. Going to a traditional university may be difficult to impossible. Kaplan University is geared toward helping such nurses enhance their profession through higher education. They offer many online and campus classes and have dedicated faculty and advisers on staff that will guide you along the way. They have high ratings in satisfaction and relevancy from their graduates. Founded in 1937, they are fully accredited by The Higher Learning Commission (HLC) and are a member of the North Central Association of Colleges and Schools (NCA), and offer blended programs in fields such as arts and sciences, business, criminal justice, education, health sciences, information systems and technology, legal studies, and nursing. Depending on the course of study, students can earn associate, bachelor and master degrees, as well as certificates and diplomas. Nursing is a wonderful career that offers many more opportunities in this day and age than ever before. The impact you will have on countless lives as a nurse is very rewarding in so many ways. Nursing is in high demand in our country and it is an excellent career change path for those seeking to make a difference, earn better pay and achieve personal autonomy. With so many job uncertainties you know that there will always be a need for qualified nurses, and even more so with the expected shortage of primary care providers. Investing in continuing education degree and certificate programs at Kaplan University is one way to meet the demand and grow your career. As an accredited university built on more than 75 years of experience, + Kaplan University offers a wide range of career-focused programs designed to develop the skills and knowledge leading employers seek. Our focus: to offer you the most direct educational path to achieve your goals. * My Disclaimer: I was compensated to write this post by Kaplan University and BlogHer, but all statements and opinions expressed are my own, and not influenced in any way by my compensation. The city of Denver, like most large cities, comes alive with Christmas lights this time of the year! The Denver Post had an article that the very first outdoor electric lighted Christmas tree was lit in 1914 by D.D.Sturgeon, one of Denver's pioneer electricians, to cheer his gravely ill grandson. Since then Downtown Denver has been illuminated with "Winter in the City" holiday lights and events to bring Christmas cheer to all! Every year a Parade of Lights begins the holiday season in Denver, with two miles of marching bands and lighted floats. 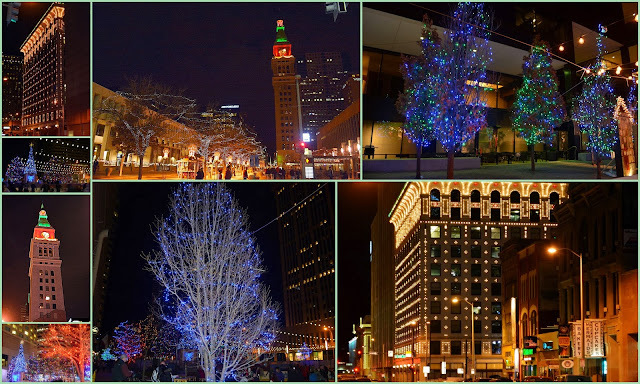 The 16th Street Pedestrian Mall is lit with more than 550,00 energy efficient LED lights as part of the great illumination of the city, The Denver Zoo has an elaborate Zoo Light display, and The Denver Botanical Garden has a Trail of Lights and Blossom Lights displays. The top of the D and F Clock Tower is beautifully lit and is a focal point in the downtown sky. The Southwest Rink in Skyline Park also adds to the festivities. I liked the apparatus they had for beginner skaters to use to help balance themselves. The skating is free, as long as you bring your own skates. Rental of skates are available at nominal cost. The Christkindl Market lights up another section of Skyline Park. There will be more about this wonderful authentic German market in my next post. 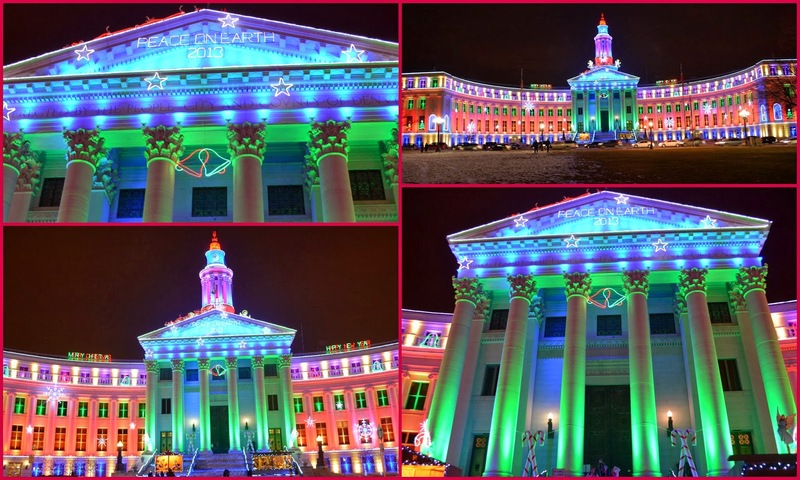 The most spectacularly lit building is the Denver City and County Building. It is covered with over 600,000 lights! On either side of the building's steps are two display boxes. On the left side is a display of Santa's elves. On the right is a beautiful Nativity display. On the top of the left building, you can see Santa in his sled, pulled by eight tiny reindeer! A closer look at Santa Claus on the rooftop! I have to say this is one of the beautifully lit municipal buildings I have ever seen! 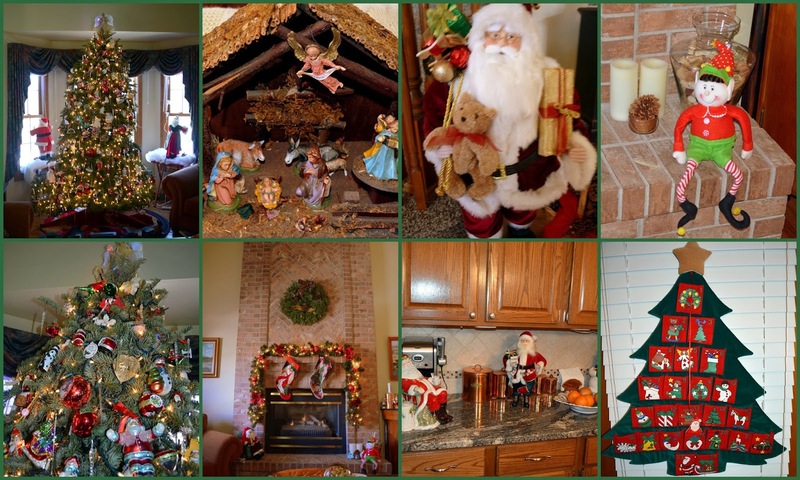 Many households around the Denver area also have beautiful light decorations, and the Denver Post web site has a Holiday Lights section that gives locations of the best displays. I'm seeing more of my neighbors putting up lights this week, now that our cold spell has left us. Temperatures will be in the high 50's, low 60's this week, which is making decorating much easier to do. It will also be nice weather to drive around to view the displays. I finally completed decorating my Christmas tree today! We also took a trip up to the charming, heritage silver mine town of Georgetown this weekend in the Rockies to take in some of the holiday festivities there. 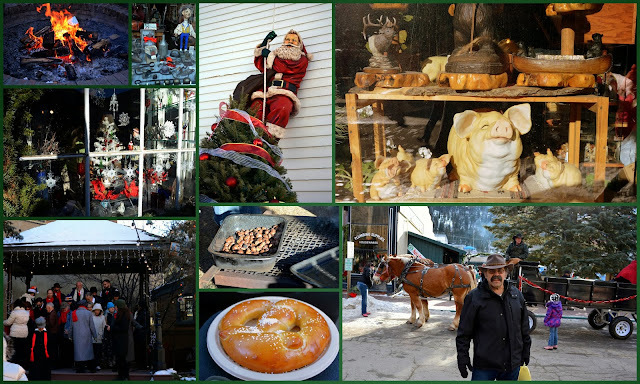 Come back and visit again soon to see these posts and the Christkindl Market in Denver! It's certainly the most wonderful time of the year! Campbell's Cooking Soups--Cooking Up Comfort!